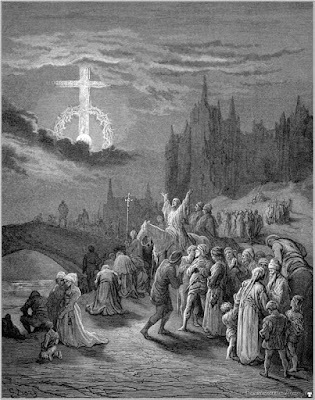 The Cross That Appeared in the Sky Over Jerusalem in 351 A.D.
And now that it has appeared, it sanctifies also the heavens. On the seventh the seal of the cross spread out in the heavens. 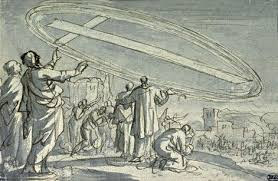 On this day in the year 351, not long after Saint Cyril of Jerusalem had succeeded Maximus as Archbishop of Jerusalem, during the reign of Constantius, the son of Saint Constantine the Great, on the day of Pentecost, the multi-attested sign of the Cross appeared over Jerusalem. He concludes his letter with wishes that the emperor may always glorify the holy and consubstantial Trinity. Historians of the time, both Orthodox and non-Orthodox, including Sozomen, Theophanes, Eutychius, John of Nice, Glycas, and others quote Saint Cyril concerning this event. Others, such as Socrates, Philostorgius, and the anonymous Chronicle of Alexandria give their own account of this phenomenon. This miracle was regarded by the Christians as the final victory of Orthodoxy over Arianism. 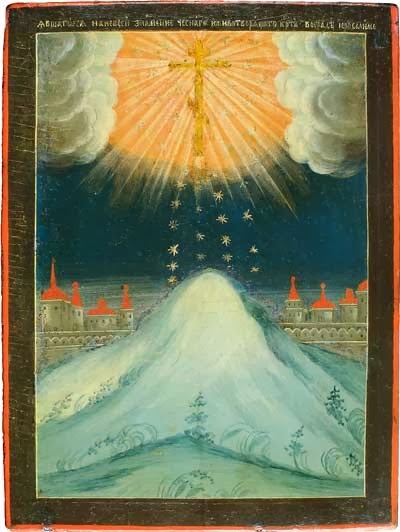 Philostorgius and the Chronicle of Alexandria affirm that this Cross of light was encircled with a "large rainbow". The image of Thy Cross at this time shone brighter than the sun, when Thou didst spread it out from the holy Mount of Olives to Calvary; and in making plain Thy might which is therein, O Savior, Thou didst also thereby strengthen the faithful. Keep us always in peace, by the intercessions of the Theotokos, O Christ our God, and save us. Making its rays to shine above in the heavens, the spotless Cross dawned on the earth, bright with splendour; for it had opened Heaven, which was shut of old. Granted the effulgence of its divine operation, we are surely guided to the unwaning resplendence. In battles we possess it as a true weapon of peace and a trophy invincible. 1. According to Herodotus, one stadia is equal to about 600 feet.